The Site Is About All Of PC Troubleshooting, Software Problem and Tips 'n Tricks. Process 1: The antivirus like Kaspersky, Quick Heal, K7 and the other top most antivirus are very good no doubt and also expensive software. You don't need to buy any kind of anti-virus if you have Windows 7 or Windows 8 installed on your system. Because Microsoft provide a free antivirus and anti-malware (Windows Defender) with Windows 7 and Windows 8. To active this make sure you don't have any other antivirus installed on your system. If already installed, you have to uninstall this from your system. 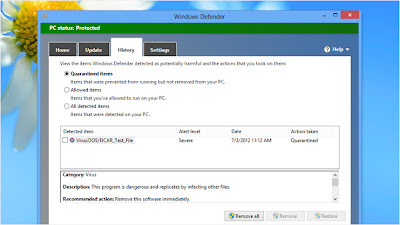 To run Windows Defender on windows 7 go to start and Type on the search bar “Windows Defender”. When found click on it and run. If you have an internet connection then update it first. Process 2: If your computer dose not open or run normally for badly virus infection just download antivirus like quick hell, Kaspersky from your friend's computer and active trial version .After opening this application you'll find an option “make emergency disk”. 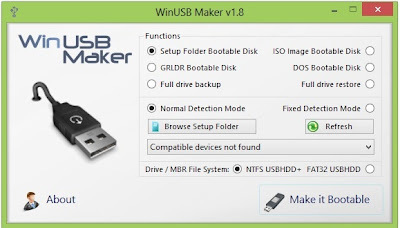 Just click on it and follow the instruction and make a bootable disk using a blank cd or pen drive (The process of making your pendrive bootable is given below)). After Creating a boot disk now go to your PC and run the disk while booting. But before that make sure that CD/DVD drive is enable as 1st boot device. If not so then go to boot menu option while starting your system by pressing "DEL" and select first boot priority as a cd drive or pen drive which u have. And boot your computer it will take some time and it remove all virus and also repair your infected files and folders. After finish these process please active “windows defender” for further security of your computer which I mention above. Process 3: If window defender does not work perfectly on your computer just download any popular antivirus from internet and active trail version and scan your full computer to remove virus from your computer. Windows Defender, its a free application which helps you stay protected your computer against pop ups, slow performance and any security threats which caused by spyware and potentially unwanted software and maleware. Windows Server 2003 Service Pack 2 x64 Edition, Windows XP Service Pack 2, Windows Server 2003 Service Pack 1, Windows XP Professional x64 Edition, Windows Service Pack 7 and Windows Service Pack 8. 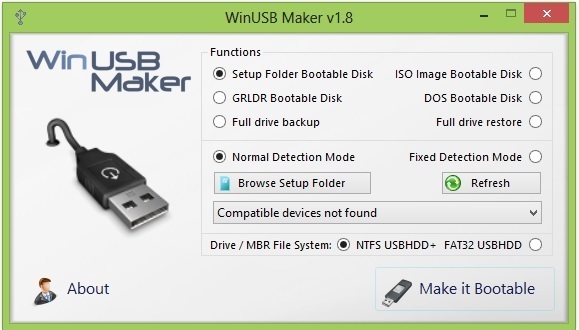 WinUSB is a tool that dynamically make your External Disc Device / External HDD bootable. Run WinUSB. Then Click on 'Browse Set up Folder. Now select the folder that contains the Files that you want to make bootable(also may be an ISO or Image file). Now Click on OK. And click 'Make It Bootable'. Now all done. Just wait. Superb and quality service is provided by CD Replication Scotland is additionally applicable for software package, presentation product, DVD duplication and music and totally safe from virus. Thank you for sharing. Its informative and full of information. Di sini anda bisa mendapatkan prediksi togel singapura yang bisa anda gunakan menjadi acuan dalam memasang taruhanPrediksi togel singapura . lihat prediksi togel singapura minggu ini Prediksi Togel sgp keluaran togel singapura paling jitu. I actually regarding each and every bit of it. it's far a splendid website and general allow. I want to thankful. exquisite business! each unmarried certainly one of you do a cerebrum boggling weblog and have a few astounding substance. hold doing lovely. You don't got to obtain any reasonably anti-virus if you've got Windows seven or Windows eight put in on your system. as a result of Microsoft offer a free antivirus and anti-malware (Windows Defender) with Windows seven and Windows eight thesis and dissertation. If window defender doesn't work absolutely on your pc simply transfer any standard antivirus from web and active path version and scan your full pc to get rid of virus from your pc assignment help.